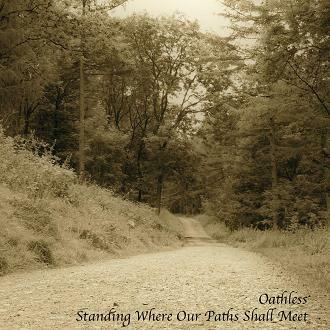 Enigmatic-sounding album by Oathless (Simon Housley) – “Standing Where Our Paths Shall Meet” – was released on Hawk Moon Records November of 2010, and turned out to be a great example of confluence of experimental dark ambient and classical music. You can hear such ordinary instruments as piano, stringed instruments, guitars, but in spite of their ordinarity, there is a very atmospheric and peculiar way of using them – the author seeks for atmosphere, not for melody. And he did it successfully. The music of Oathless here is deeply dedicated to Nature, some great pictures of open air arise during the listening. I would like to mark out the track “Tigerlily” with its smooth, undulatory scheme and feeling of prostrating space and sunshine comfort. So, let’s stand, where our paths shall meet, and enjoy the sparkling music of Oathless. This entry was posted in Uncategorized and tagged ambient, Hawk Moon Records, Oathless. Bookmark the permalink. Very good site. I’ll have to read more tonight. Keeping up to date with some of these releases, not to mention giving them necessary time to sink into my skull by repeated listening requires a 35 hour day. Taking the time to post these things is seriously appreciated.